SHANK: The shank is the stem of the anchor in which direction is pulled to set (bury) the anchor. FLUKE: The flukes will be buried into the seabed. The very tip of a fluke is sometimes called the bill. STOCK: The stock ensures the anchor sits on the seabed properly, enabling the flukes to dig into the surface. CROWN: The crown connects the various parts of the modern anchor. TRIPPING RING: The tripping ring is used for the optional tripping line: by pulling the tripping line, the anchor will break out. RODE: Not shown in the photo, "rode" is another word for rope; specifically the rope between the anchor and your boat. "What is the best kind of anchor and rode for my boat?" We get asked that question a lot, and the answer is often "more than one anchor, of different types." While you might wonder if we are just trying to sell a few more anchors, the experts generally agree with this viewpoint. The type of bottom–mud, grass, sand, coral or rock–will dictate different choices of anchors, as will the size and windage of the boat, the wind conditions and the seastate. Some anchoring situations also call for more than one anchor. You sometimes need to set two anchors in a crowded anchorage, with anchors at the bow and stern of the boat to limit its ability to swing. Two anchors set from the bow at a 60° angle are another good way to improve security against swinging and dragging, and they allow you to shorten the rodes and use less scope. In heavy weather conditions, where one anchor may not have enough holding power, setting a second anchor may be critical to staying put. Remember that as the wind speed doubles the force on the boat (and the ground tackle system) increases by four times. While the above cases show the need to sometimes set two anchors at once, having two anchors of different designs help ensure good holding in different types of bottoms. One anchor of the Danforth style and one plow anchor are typically all you need. Except for coral and rocks, where the old–fashioned Yachtsman anchor may work best, either a plow or a Danforth should hold adequately in most conditions. The most popular anchor style is the Danforth and is often the sole anchor on many smaller boats. Light and easy to weigh, it stows flat and holds very well in mud or sand. Its excellent holding power–to–weight ratio means you can use a lighter anchor compared to other types, but it doesn’t hold well in grassy or rocky surfaces. Its flukes and stock (the wide crossbar at the top) are more prone to foul on rocks or the anchor line. Plow anchors, the "single point" style represented by the CQR, Delta, Manson Supreme and Claw, have the best all–around holding ability in varying bottom conditions. They generally reset themselves easily if the wind or current changes direction, and hold effectively in grass, mud and sand. They do not have projecting flukes that foul easily, but rely more on sheer weight for holding power. Their shape makes stowing them more awkward (a bow–roller or bowsprit is the best solution). Heavier powerboats and cruising sailboats often use plows as primary anchors. Sizing an anchor for your boat reinforces, with some limits, the "bigger is better" idea. If your engine fails and you are drifting toward a lee shore, having a properly sized anchor ready could save your boat. But raising the anchor by hand, with no electric powered windlass, calls for light and efficient ground tackle (and a strong back). Take the manufacturers’ suggested sizes into account and consider your boating style. Do you typically anchor for two hours or for two weeks, in a lake or in the Atlantic Ocean? 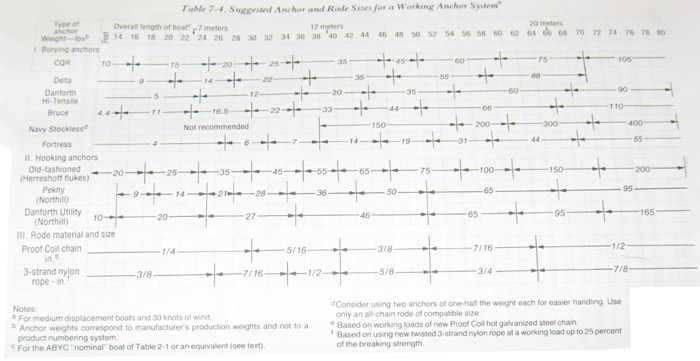 The chart below might help you find an appropriate anchor size for your boat under most conditions. What you are looking for when buying an anchor is holding power, which may have little relation to the anchor’s size and weight. When an anchor penetrates the surface of the seabed, suction created by the bottom material, plus the weight of the material above the anchor, creates resistance. In rocky or coral bottoms anchors can't dig in, but rather snag on protrusions and hold precariously. The holding power of modern anchors is remarkable, varying between 10 and 200 times the anchor's weight. This means that some anchors that weigh only 5lb can hold in excess of 1,000lb! But with the widely varying conditions in the real world, how do you select the anchor that's right for your boat? Quick to set, and to reset when the wind/current shifts. Good holding in all bottom types: sand, mud, rocks, coral, and grass. Strong–able to handle high loads on any part of its structure. Good holding power, even at short scope. Easy to release from the bottom without damage. Compact to store on deck or in a locker. Alas, no single anchor possesses all of these attributes, but certain anchors represent a good balance for given conditions. Sand: Fine–grained sand is relatively easy for anchors to penetrate and offers consistently high holding power and repeatable results. Most anchors will hold the greatest tension in hard sand. Pivoting–fluke anchors are the best type in sand. Mud: Mud has low shear strength, and requires anchor designs with a broader shank–fluke angle and greater fluke area. This allows the anchor to penetrate deeply to where the mud has greater sheer strength. Mud is frequently only a thin layer over some other material, so anchors that can penetrate through the mud to the underlying material will hold more. Fortress anchors have greater holding power in mud because they can be adjusted from their standard 32° to a broad 45° fluke angle. Rock and Coral: Holding power is most dependent on where you happen to drop the hook, rather than the type of anchor. Plow–shaped or grapnel–type anchors, with high structural strength to sustain the high point–loads, generally work the best. These anchors include the Claw, Manta, CQR, Delta, and Supreme. Shale, clay, and grassy bottoms: Tough bottoms for all anchor designs, with the weight of the anchor, more than the design the most important factor in penetration and holding power. CQR, Delta, and Supreme anchors are thought to be good due to their ability to penetrate the vegetation. However, these conditions have a high probability of false setting, due to the anchor catching on roots and protrusions, rather than something solid. We see anchors as a critical piece of safety gear to protect your investment in your boat. As a rule, you should not compromise with lower quality "cheapo" anchors. Be on the lookout for spotty galvanizing, poor welds, and other inconsistencies in the metal. Pros: adequate holding power in sand and mud. Precisely made to original Danforth dimensions for roll stability and dependability, with accurately controlled stock length and shank–fluke angle. Cons: Limited or no holding in rock, grass, or clay bottoms. Pros: Fluke angle can be changed to either 32° or 45° for extremely high holding power in hard sand and soft mud. Lightweight and strong. Disassembles for storage. Cons: Relatively expensive. Limited holding in grass, rocks, or clay. Pros: Extremely strong construction, made from heat–treated high–tensile steel. Great in sand and good in mud. Precise 32° shank–fluke angle for high holding power. Traditional dimensions for roll stability and deep penetration. T–shaped flukes for symmetry and strength. Pros: Great reputation and very strong construction. Stows easily on an anchor roller, and sets well in most seabeds. Penetrates weeds, sand, and mud, and hooks on rocks. Cons: Requires large size for given boat size. Expensive. Pros: High holding (Lloyd's certified) for big boats to megayachts. Hinged shank and weighted tip for maximum holding power. Cons: Requires large size for given boat length. Expensive. Pros: Inexpensive. Sets quickly and reliably in most seabeds and resets well. High–strength one–piece design. Roll stabilized. Cons: Difficult to stow without rollers or chocks. Limited holding power in mud or soft sand. Pros: Roll bar for easy resets. Strong high tensile steel construction. Excellent test results for this and similar anchors like the Spade. 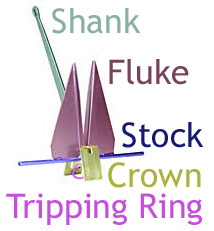 Self–launches from most bow rollers.